American Idols LIVE! Tour 2008 was a summer concert tour in the United States and Canada that featured the top 10 contestants of the seventh season of American Idol, which aired in 2008. This tour followed in the tradition of other American Idol summer tours following the completion of the season in May. The 53-date tour which covered 49 cities started on July 1 and ended on September 13. The tour was sponsored by Kellogg's Pop-Tarts and Guitar Hero. In a departure from previous tours, where the shows consisted of many duets and/or group performances, shows from this tour were crafted as a series of mini-concerts for each contestant because of the diverse talent working in different genres. Each performer performed their own set of songs – three songs for the tenth-place finisher Chikezie, increasing up to five songs for the winner, David Cook. Each of the two segments of the show ended with a group number. Most of the finalists on the tour chose to reprise at least one song they had previously done on American Idol, apart from Ramiele, who selected a whole new set of songs. Others chose songs they had wanted to perform on the TV shows but were unable to, or performed but not shown, such as David Cook's "My Hero" (Foo Fighters), and Jason Castro's "Crazy" (Gnarls Barkley). 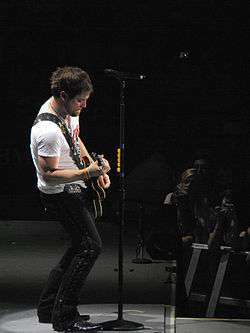 The participants of the tour themselves had planned on an ensemble performance as revealed by David Cook on EW.com's Idolatry, where the possibility of a live collaboration of "Barracuda" featuring himself on guitar, Jason Castro on drums and Carly Smithson on vocals was mooted. The suggestion was however rejected by Idol tour producers. David Cook performing during the American Idols Live! Tour 2008. Kristy Lee Cook: "Squeezin' the Love Outta You" (Redmon and Vale), "God Bless the USA" (Lee Greenwood), "Cowgirls" (Kerry Harvick). Kristy Lee Cook sang "Anyway" (Martina McBride) in place of "God Bless the USA" in the Toronto show. Michael Johns did a short a cappella version of "Light My Fire" on the anniversary of Jim Morrison's death at the Fresno show. David Cook and Michael Johns did a short dance together, different for each show, at the final group song for most of the shows. The producers stopped their dance performance for a few shows, but relented due to fans' demand. During the intermission, a video of the Top 10 performing "We're An American Idol Band" in 70s outfit was shown as part of Guitar Hero World Tour rockumentary, and a Guitar Hero contest for the some members of audience was held. The 2008 tour was far more successful than 2007's. Sales were up 38% in revenue per date and average attendance number up 35% compared to 2007. The average percentage of seats filled was 85.1% compared to season six's 68.4%; and 9 out of 53 shows were sold out. It is ranked as the 24th biggest grossing tour of 2008 on Billboard's Year-End Music Charts, earning $29,906,507 from a total of 493,296 tickets sold. Due to the success of the 2008 tour, Fox and 19 Entertainment have decided to hold a tour called Idols in Concert for the Holidays. The former Idol contestants headlining the tour include David Hernandez (season 7), Diana DeGarmo (season 3), Kimberley Locke (season 2) and Chikezie (season 7). ↑ David Cook on Idol's heinous group numbers and a very cool tour collaboration! Wikimedia Commons has media related to American Idols LIVE! Tour 2008.